Betta fish may have a reputation for being fussy eaters, but both freeze dried and pellet foods have proven to be extremely popular among the breed. Not only do these foods taste delicious, but they also provide betta with the high protein and fiber diet they need. These fish make wonderful pets and can live for years when cared for properly, therefore it’s important to feed them the best betta food you can possibly lay your hands on. Read on for a comparison and review of 7 of the top most recommended foods for betta fish. Do Betta Fish Need a Diet Different to Other Species? What Makes Freeze Dried Food and Pellets the Best Betta Food? What Makes a Poor Quality Betta Food? Can Betta Eat Tropical Fish Food Flakes? How About Betta Fish Flakes? What Specific Food Ingredients are Good for Bettas? What Specific Ingredients are Not So Good? How Much Food Does a Betta Eat? How Often Should You Feed Your Betta? Many other common breeds of fish, such as goldfish, are omnivores who prefer a mixture of plant-based food and meats. Bettas, on the other hand, are carnivores who need a diet almost solely comprised of meat proteins. Despite what you may have heard elsewhere, they cannot survive on plants alone (a bowl and a peace lily anyone?) and it’s actually cruel to make them! As detailed in our guide ‘What do betta fish eat‘, in the wild their diet would consist of worms, flying insects such as mosquitos and midges (including their larvae), as well as smaller fish on rarer occasions. Because of this, they have evolved to live on and need a diet much higher in protein than many other breeds of fish. Bettas thrive when fed a diet resembling the mostly carnivorous and high protein diet that they would have in the wild. This is why freeze-dried food and pellets specially formulated for them are a great option because they have been created to mimic this natural diet safely and with minimal processing. Because these foods contain a lot of high quality, natural high protein ingredients, they are far less likely to cause digestive problems than some other foods. Freeze dried food is highly recommended because unlike ‘live foods’ or fresh frozen food, all bacteria and parasites are killed in the freeze-drying process, meaning it will never introduce disease into your aquarium. 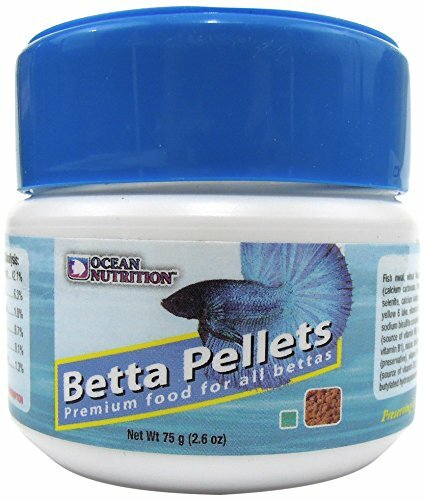 Betta pellets are also a good option, as they have been specially formulated to match their exact dietary requirements. When it comes to meal times, they also love variety, so pellets are a nutritious option to mix things up instead of only freeze dried. Pellets are also an affordable option and owners with little experience will find them easy to use and consistently feed the right amount of – simply sprinkle a few in the tank once a day. If the pellets aren’t specifically described as being formulated for bettas, then it’s best to search for one that is. Their dietary requirements are very different to a lot of other fish. Additionally, some generic pellets may contain large amounts of cheap ‘bulking’ ingredients which contain no nutritional value. A great way to tell is whether the brand lists proteins at the top of their list or further down the bottom after ingredients such as wheat and flour. These ingredients are always listed in order of concentration, from highest to lowest. It’s important to know how to interpret fish food labels correctly so that you’ll be able to spot both desirable and non-desirable ingredients in products, but simply looking for protein as the greatest ingredient with no or very little fillers is the key. Although they are a tropical fish, standard tropical flakes are not a good food for them. Tropical fish flakes are almost all very high in plant-based ingredients, whereas betta are carnivorous and need a much higher protein diet than regular tropical flakes will provide. If you have to feed them, they will not outright harm your betta, but you will not be doing what’s best for them, so please avoid generic tropical flakes. Some manufacturers have formulated specialist ‘betta fish flakes’ that are tailored more toward their high protein diet. These are OK to use, but we do not recommend them and will not be covering any in this guide. The reason for this is many bettas are fussy eaters and just will not eat these flakes. This happens surprisingly often. So we do not want to recommend something you may then buy, that doesn’t get eaten, leaving you out of pocket and your fish still hungry! Also, flakes can be a quick way to mess with water quality. They disperse and dissolve quickly into the water, so lots of it doesn’t get eaten. Of course, there are usually leftovers with most foods, but the more solid options are easier to remove after feeding time. Flakes get all over the tank and are almost impossible to remove, becoming left to fall into every nook and cranny of your tank, to rot and pollute your aquarium environment over time. So yes, we will not be recommending any flake foods and in our opinion you should consider them as a last resort option if you have nothing else available. The very best betta food is unarguably live food, with ‘frozen fresh’ coming in second place. However, for the hobby or casual fish keeper, we do not confidently recommend them. But why, you surely must be asking? Because there is a very high rate of fish coming down with diseases and parasites when they are fed live or ‘fresh frozen’ foods. Some of their favorite foods such as mosquito larvae and bloodworms can bring such dangers into your tank. You might have a good, clean, reliable source for many months, and then one bad batch can spell disaster. If you’re confident of a good, clean supply, then by all means use them, your betta will love it, but know that it is risky. And you should be prepared in advance to deal with any betta fish diseases and parasites. Brine shrimp and wingless fruit flies are two further options for live or fresh frozen foods that carry less risk, but they are harder to come by. So you CAN feed the above foods, but we feel for most casual fish keepers it’s not worth the risk. However, the decision is of course yours. Freeze dried foods are our top recommendation when it comes to the best food for betta fish. They are the closest you can get to their natural diet without resorting to actual live food which as discussed, often carries risk of introducing disease or parasites into your tank. Freeze drying removes this risk. Generally speaking, you would feed freeze dried blood worms, or brine shrimp, though freeze dried daphnia are sometimes fed and are suitable too. Before you feed a freeze dried food, it’s recommended to soak them in a little tank water for a few minutes beforehand, so they soak up some moisture, making them easier to eat and taking away any swelling of the food once it’s in your fishes stomach. Soaking freeze-dried foods also go some way to bringing them back to a natural texture and mouthfeel for your fish. They will not feel just like live, but will feel better than if completely dry. San Francisco Bay Brand is a well known, popular and quality supplier of freeze-dried fish food, with the brine shrimp being a particular favorite of many fish keepers of different breeds. Being freeze dried, it doesn’t carry risk of disease or parasites like live foods do, and SFBB test the food for health and safety and your peace of mind. Excellent for the main component in a betta’s diet, but also good for the occasional treat or supplement for variety if you prefer to feed pellets daily. The instructions say to feed twice daily, and you should only feed a small amount about the size of your fishes eyeball, and 3 minutes later remove any uneaten to avoid polluting your tank. Owners report that their fish love eating this product. The lack of low nutritional fillers (such as wheat products) and high concentration of protein (min 48.8% according to the ingredients list) means that this product shouldn’t cause digestion problems with your betta and it adheres to their dietary needs. The small pieces expand when dropped into the water and break up into several pieces of dried brine shrimp, therefore you get good value for money as a container could last for a few months (depending on how populated your tank is). As with all freeze-dried products, there is no risk of spreading bacteria or harmful parasites in your tank (as opposed to live food). The ingredients of this product simply list “brine shrimp”, meaning that it is completely natural. Some users of this product state it clouds their tank slightly which could be due to the moderate amount of crude ash in it, however, this is still significantly lower than less nutritional food alternatives such as flakes. The vast majority of users reported no such issue and we certainly never encountered the problem during our use. 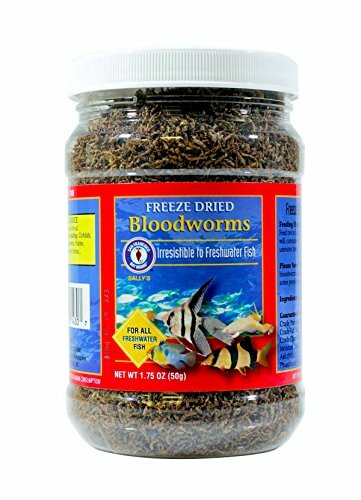 Another favorite from San Francisco Bay Brand is their line of freeze-dried bloodworms. These are aquatic midge larvae and an absolute favorite of betta, so these are highly suited to those who show fussy eating behaviors. We wouldn’t recommend these as your fishes ONLY food – you should supplement with bloodworms and pellets for fibre – but they should form a good part of their diet. Users of this product say it’s the best value for money. The amount supplied is far larger when compared to freeze-dried bloodworm products of a similar price range. This product contains red mosquito larvae, a source of high protein that closely resembles a betta’s diet in the wild. Because this product has been freeze-dried, there is no risk of spreading potentially fatal bacteria or parasites as there would be if using live mosquito larvae or bloodworms. Users of this product have also noticed increased energy and growth of their fish. A similar product but from an alternative supplier to the SFBB brand of bloodworms above, Tetra are a huge, well known and trusted brand in the aquarium market. Blood worms are incredibly high in protein and give a welcome boost to protein content in any diet if fed as a treat or supplement. They should be a part of any betta’s diet. As with all freeze-dried food, we recommend soaking these in tank water for a few minutes before feeding and removing any uneaten after 2 or 3 minutes of feeding. This is a high quality product that is perfect for those on a budget as prices begin at just a couple of dollars. 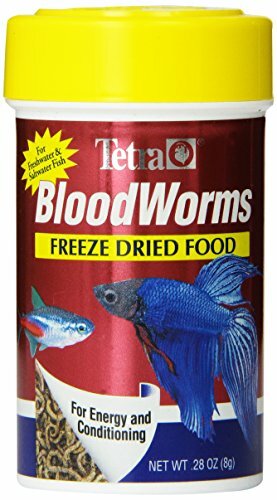 Users of this product report that the freeze dried bloodworms are in excellent condition and aren’t squished like other store-bought bloodworm products. Like other freeze-dried products, there is no risk of spreading potentially fatal bacteria or parasites as there would be if using live bloodworms. This product does not cloud your tank water, as opposed to some other freeze dried products. Some users of this product reported a small percentage of the contents had been crushed or somehow ‘turned to dust’ and so was unusable. This is an issue with any freeze-dried food to be honest though, because by it’s very nature it is completely dry and fragile. A minor issue only that’s found with any such food so I wouldn’t worry. Not the best food for betta fish – it’s important to note that their diet should mostly consist of various freeze-dried foods – however supplementing their diet with pellets once or twice each week will provide them with a vital source of fiber to aid with digestion. Pellets should also be soaked in water 1 – 2 minutes before feeding them to remove air from the product. This prevents them from swelling in their stomach and causing bloating or constipation. When shopping for pellets, make sure they are formulated specifically for betta. Other, more generic pellets will have far more plant based content, fillers and ingredients that will not benefit them. New Life Spectrum is made in the USA, from all natural ingredients including mussels, krill, herring, and squid. There are some additives, but they are all natural too and included to enhance and sustain color in your fish, as well as provide vitamins and minerals essential to good health. Marketed as ‘semi-floating’ pellets, these will stay near the surface for a good time, allowing your betta to eat more naturally from near the surface, and not sink forcing them to eat from the bottom which they wouldn’t usually do. The high level of protein and absence of any low-value fillers makes these pellets easily digestible, leading to less waste and hence do not adversely affect water quality. Unlike some other products, this has been made in the USA. It contains superior quality meat products such as south Antarctic krill, herring, squid and new Zealand mussel protein. These specially formulated betta fish pellets include natural ingredients rich in vitamins and minerals for color enhancement. Including: algae meal, that consists of seaweed, kelp and Haematococcus pluvialis (a micro algae), a premium grade of natural Spirulina, as well as fruit and vegetable extract. The addition of garlic also contains anti-parasitic and immune boosting properties. Compared to other brands of pellets, this product is a bit more expensive, however you’re paying for its excellent quality. NutriDiet is a large and popular brand in the world of fish keeping, trusted by many to solve the nutritional requirements of their aquatic friends. These pellets have a krill and fish meal base, with added carbohydrates, vitamins and minerals, to provide all the essential nutrients your betta needs, with no cheap and empty fillers. Instructions are to feed daily, as much as each fish will eat in 2 minutes, then remove uneaten food from the tank. These pellets are high in protein as they contain a krill base. Unlike other pellet products, these do not contain low nutritional fillers such as corn meal. It is low in ash (maximum of 9%) meaning that there is less chance of it making your tank water cloudy. This product also contains many of the vitamins and minerals we listed previously, including Calcium Propionate, Vitamin C, Vitamin A, Vitamin D3 Supplement, Riboflavin Supplement (B2), Vitamin B12 Supplement, Folic Acid, Thiamine (B1), and D-Calcium. Users of this product have reported a significant increase in their betta’s activity and colors since feeding them this product. Some users believe the size of these pellets may be too large for smaller sized fish, however moistening them first in water for 1-2 minutes may make them more easily digestible. Because of our high level of expertise and innovation, we supply a lot of the world’s biggest public aquaria and breeders of marine and freshwater tropical fish. Recognized as a pioneer in the field of ornamental aquaculture, we are committed to provide our hobbyists with the most up-to-date feeds that give their fish optimal health, color and vitality. This food is of high quality, designed to provide the most complete, nutritionally balanced food available for betta. Promising also to enhance your fish’s natural color, while not clouding the water as many other foods can. Designed to be floating pellets, as preferred by surface feeding betta, these pellets are easy to feed, and to remove once feeding time is over, so they will not disappear into your tank to decompose and pollute the water. Product contains fish meal and krill meal, both great sources of natural protein. The smaller size of these betta pellets creates fewer problems, with all sizes of fish being able to eat them. Because the pellets float for longer than other commercially available pellets, users report that the product allows their tank to stay cleaner for longer producing no cloudy water. Some product users have also noticed the colors of their betta becoming more vibrant from feeding them these pellets. The pellets do contain some preservatives including calcium propionate and ethoxyquin to keep them fresher for longer. 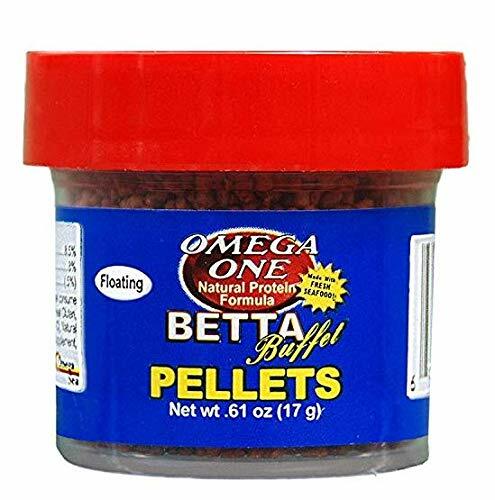 Omega one betta buffet pellets are 1.5mm slow sinking pellets. Bite sized, and remain at the surface of the water for easy eating and removal for most of the feeding time. Though they do eventually sink, so can get lost in the substrate, or lie waiting for any bottom feeders you have in your tank to devour. The binder in these pellets is not water soluble, so the pellets do not disintegrate after a short while in your tank and are easy to remove if left uneaten. High in protein at 42%, with added fats, fiber – for digestion – and vitamins, these are a nutritionally complete food for your betta. However, as always, we do recommend to supplement with a variety of bloodworms, daphnia, and / or brine shrimp on occasion. This product contains natural pigments from salmon skins to boost your fish’s coloring. It’s also rich in Omega 3 & 6 HUFA’s to support immune system health. These pellets are low in ash (8% maximum) to prevent your tank water from turning cloudy when feeding. Some users have complained about some pellets sinking quite fast to the bottom of the tank. This meant their betta had to chase it down and eat it before it hit the bottom and was lost in the substrate. The vast majority of users had no such issues though – maybe just a bad batch? The generally agreed amount of food to provide is as much as they can eat inside of 2 minutes, and to then remove any excess from the tank. The logic behind this is they only have tiny stomachs that fills quickly, though many betta will continue to eat past this point, gain weight, and sometimes cause themselves bloating, constipation and digestive issues. Furthermore, anything left in the tank that doesn’t get eaten will just decompose and pollute the tank, affecting water quality, so it’s better to remove it. For an adult fish, once per day is enough, though sometimes two is preferred by some fish and in fact, some foods are developed to be fed twice per day, which will be noted on the feeding instructions on the packet. For younger, still growing juvenlies it is recommended to feed them twice per day, so they always have an abundance of nutrients and energy required for healthy growth, rather than the somewhat ‘feast and fast’ cycle that eating once per day can be likened to. For all fish, it’s also worthwhile to have a day where no food is given, to allow their systems to clean out, which goes a long to preventing digestive issues such as constipation and bloating. Bettas are prone to overeating, which can lead to digestive issues and even premature death. Their stomach is very small – about the size of their eye. Therefore, feed them no more than about 2 or 3 pellets per feeding. It should be able to finish all its food in approximately 2 minutes. Although they are notoriously picky eaters, spitting out food doesn’t always mean he is rejecting it. It’s possible he’s just softening the food to make it easier to eat. Keep an eye to see if it gets eaten. If it isn’t, the pieces may be too big. Crush the food into smaller pieces next time. If your betta is spitting and not eating it after, he may, in fact, not like it. In this case, you’ll need to switch to another kind of food. It’s possible for a betta to survive up to 14 days without food, but this is not recommended. They can safely go up to 6 days without undue stress, and a fast of 2-4 days can be beneficial. If you’re going away for a weekend, you can safely leave your betta without food. Many owners habitually skip at least one day per week to allow the fish to clear its digestive tract. Fish are a lot like some dogs and most people – they won’t stop eating just because they’re full. Overfeeding a betta can cause many problems, including bloating, constipation, issues with the swim bladder, and even death. Never feed them more than they can eat in two minutes and only feed an adult once a day. Your betta will eat every day if you offer food, but it isn’t necessary. Many owners skip one day per week to help them clear their digestive system and avoid bloating and constipation. If you’re going to be away for 2-3 days, it is ok to leave your betta without food. For longer absences, consider an automated feeder or having someone come over to feed your fish. Establishing a feeding schedule will help your betta stay regular, and it helps you remember to feed it. The time of day isn’t that important, just as long as you’re consistent. Allow time for your betta to wake up in the morning before feeding, and you might want to avoid feeding before it enters its overnight rest period. They can eat human food, but it should be restricted to treats and not become a part of regular feedings. Among the foods you can offer are peas (boiled, skinned, and cut into quarters), lettuce, cucumber, fresh fish, small bits of bread or crackers, and soft fruits like bananas and mangoes. Avoid anything processed or seasoned, and do not offer land-based proteins like pork, chicken, or beef. Remember, bettas are picky eaters so you may have to experiment until you find something yours likes. After looking at the pros and cons of each product, we recommend San Francisco Bay Freeze Dried Brine Shrimp and New Life Spectrum Betta Formula pellets as the two best betta foods in our roundup. San Francisco Bay Brand’s Freeze Dried Brine Shrimp contains only natural and unprocessed “freeze-dried shrimp”, meaning there are no low nutritional filler ingredients such as wheat or soybean that can cause digestion problems in your fish. This product also has the highest concentration of protein (48.8%) when compared to other products, meaning it adheres to a betta’s high protein needs as part of their carnivorous diet. 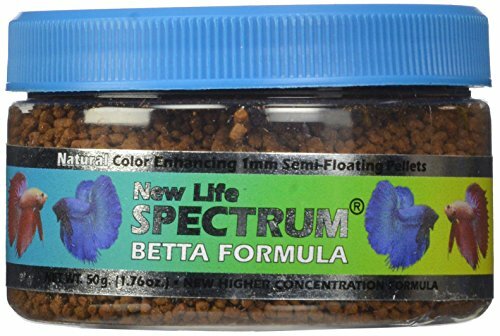 New Life Spectrum’s Betta Formula Semi-Float Pet Food is made in the USA, unlike most other fish foods which are made in China. The ingredient list shows specific and extremely high-quality sources of meat products including south Antarctic krill, herring, squid and new Zealand mussel protein. The high concentration of natural sources of vitamins and minerals are unique to this product to aid with your betta’s color enhancement, immune system health, and size development. Additional ingredients such as garlic also contain anti-parasitic and immune boosting properties. Feeding each of these to your fish, freeze-dried food daily with pellets mixed in just once or twice per week for variety and a balanced diet, should keep your betta in great digestive and all around health. Thank you for sharing. I have to say this is the best betta feeding article that I have read ever. I used to have 5 bettas, so far only one is still alive, one died of swim bladder problem, I tried all methods from online, they would not work on my betta, so I left him there, feed him, but he can not swim well, it was about one month, he died. The other three were dead of overfeeding, I think because of the frozen bloodworm or the pellet food. After four fish died, I tried to find the solution to keep the last one healthy, I found this article, very clear and helpful, I will buy the food that you recommend. I saved this website, thank you very much. Thanks Brendon. Sounds like you’ve been very unlucky? Sorry to hear that and best luck for the future! You seem to be studying up, improving your knowledge, so your doing the right thing. My betta, eggplant does not like flakes. I have tried a few brands including omega buffet. No luck. The food just gets soaked up by the filter the rest go to the bottom. I have pellets from aqueon. I tried them and he likes them. I feed him twice a day. Three or four pellets with one freeze dried bloodworms. Is this OK?